Boyzone has funded a scholarship for a music student in memory of their bandmate Stephen Gately. The four remaining members of the band will help decide who gets the award, worth 8,000 euro (£7,000), which will go towards fees at a Dublin music college. Ronan Keating said he and fellow bandmates Mikey Graham, Keith Duffy and Shane Lynch were "delighted" to have set up the fund. He said: "The other boys and I know how difficult it is for people to get a break in the music industry, so if this scholarship helps one student get closer to achieving their dream, then that's great. It really is a fantastic way to keep Stephen's memory alive among the next generation of successful Irish musicians." Gately, who grew up in Dublin, died of natural causes in 2009 at his holiday home on the island of Majorca. 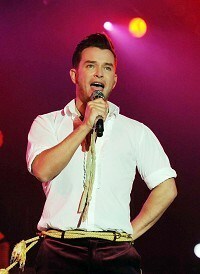 As well as his time with the band, Gately also appeared in stage productions including Joseph and The Amazing Technicolor Dreamcoat and Chitty Chitty Bang Bang. He announced he was gay in the Sun in 1999 amid rumours a national newspaper was about to out him. The Stephen Gately Scholarship will be open to any musician applying for a place at BIMM Dublin which opens its doors this September. Keating has previously funded five scholarships at the BIMM centre in Brighton, England. BIMM Group president Kevin Nixon said: "We are very very grateful to Ronan and other members of Boyzone for their continued interest in and support of BIMM. "It also feels very right to be able to offer a music scholarship to a BIMM student during our first year in Stephen's own city and give us another reason to feel very excited about BIMM's future in Dublin."